I can list the places I have been and the things I have seen. Some of these things can be seen in travelers’ guides, some cannot. The relationships and experiences I have garnered from these travels have been invaluable and always inspire me to dream and plan for adventures to come. More recently though the lessons I have acquired globetrotting have become redundant and settling into a home and integrating into a community has presented me with a new life curriculum that is equally challenging and rewarding as those that awaited me in Ecuadorian restaurants and Belgian town squares. My hiatus from blogging has not been without reason. I have been taking some time to do some personal and professional growth. For as long as I remember, I have identified more or less with my prominent life role. Someone would ask “Who are you?” and I would reply with daughter, student, traveller, or teacher. My recent personal growth has reminded me how important and satisfying being a whole person can be and how this holistic approach to life makes the roles we take in life more satisfying and helps us to continuously improve in these roles. I have been doing some deep reflection about my motivation and drive in my life and career. I took some time to anchor my spirit in a place of humility and refocus some of my egocentric tendencies to a broader understanding and compassion for others. I have started to redefine the relationships in my life. Evaluating the meaning they hold and how I can give more to these relationships. I do not think I was ready or brave enough to discuss these thoughts until more recently or perhaps allow others to influence the process. I am a believer that the teacher is waiting, we just have to be ready for the lesson. I have been blessed that my path has met with two new life guides to whom I attributes some important lessons I have started to integrate into my internal dialogue, actions and interactions. One of these guides has been my personal trainer. She has challenged me to question my existing assumptions about how I define ‘good’ or ‘acceptable’. These conversations have continued to unfold into discussions and reflections on how to improve in my personal and professional life. I have taken an honest look at daily motions of my everyday life and the results they have on my students, family, friends and others. These reflections have motivated me to not only simply ‘do’ but to simply ‘grow’. The second of these two guides has reignited my passion for life and the desire to live each moment to its fullest. I have faced some deep seeded fears and ghosts in deciding to take singing lessons. In doing so, I have been so blessed to have a new teacher in my life. She has allowed me to find peace in being vulnerable, which has brought me a new sense of humility and self-confidence. She has taught me that being vulnerable to other’s can foster self-reflection and motivation, but that I cannot let others define me. The gift of letting go of many of my fears and doubt has given me a new perspective on living. She inspires me to be a better teacher for my students and foster a classroom where they can grow with confidence and begin to grow in to the people they will become. As I continue my studies at school, which focus on the process of professional learning and school improvement, the connections between the personal process upon which I have endeavoured and the ideals a school must establish for growth are interconnected. The trusting relationships I have established with these wonderful ladies has affirmed for me that people grow from within, that we do not grow for mandates and research initiatives. People change for people, people change for the betterment of themselves because we innately want to progress. Teachers grow for their students and colleagues- and that is the power and condition of humanity. This reminds me that the belief in the goodness and potential of humanity is the foundation for education. It is what gives teacher faith in their profession and gives us faith in our students. I continue to ponder the implications of who directs initiatives for change and how change is best accomplished. I question how leaders will navigate the gray areas of morality which affect change initiatives and how we must weigh the effects of change for all of humanity as the web of interconnectedness we are witnessing in the world exponentially progresses. Most importantly though, I have learning this: growth begets growth. My goals to improve my academic, physical, spiritual and emotional growth have not lessened my ability to meet these goals, rather the opposite has happened. The growth I have made in one area facilitates my reflection and gives me experiences to draw from to help me grow in all areas. The energy and ability to let go of self-doubt and fears is helping me to be less concerned with my world and more concerned with the world and how interplay between the world, others and self can create change and how our actions and beliefs will affect those changes. Thanks to Erv Fehr and the rest of A Public Education staff for their amazing works! I have recently started Passion Projects/Genius Hour in my class room thanks to the help of Megan Calder and Crystal Lothian from #hs4 school division. Before beginning I was hesitant, worried that my students would not challenge themselves or I would not be covering core curriculum. My students are now in their 6th week of Passion Projects, and I am no longer worried. My students are all engaged in their projects, inspired by their own unique interests and while extending their learning. I have students creating step-by-step guides who struggle with organization and flow in their writing. I have reluctant learners cruising websites and You Tube videos for information on Outer Space. I have students who struggle to be advocates for themselves as learners beginning to excel and glow with confidence at the products they have created. As for curriculum, my students are meeting many English Language Arts outcomes in an authentic way. To name a few, students are reflective writing, using research skills and presenting orally – all outcomes arising out of differentiated instruction. When I watch them working on their projects, I feel as if they have all taken a leadership approach to their own education. They are asking the questions, finding the answers, taking action, and then asking more questions. When I watch this TED talk with Adora Svitak http://www.ted.com/talks/adora_svitak I felt this was very relevant to the importance of what is achieved using a Passion Projects/Genius Hour approach. Students need to be given trust to lead. Students need to know that their individual efforts and ideas are valued. Have you ever had that moment when you are direct instructing and the learner seems disconnected from what you are trying to communicate? Usually when we go through this process, we are relating it to our own experiences of learning - “What would I need to understand this concept?” “What do I need when the material is moving too fast?” This is great when we can relate our learning processes to our students, but how often do we assume we have this commonality? The more I teach students who are educated in different systems and countries, I become more intrigued by the neurological process of learning. I often wonder how the experiences in one’s culture or education system shapes the rooms and pathways in our minds. How their experiences shape the way they organize information and categorize problems then approach their solutions. Our society is becoming increasingly visual and digital. This has undoubtedly affected the way our students learn and their brains react to their environment. But what about the way the synapses connect in the minds of students who come from different educational and cultural backgrounds. What background knowledge do we assume they have? What metaphors do we assume are synonymous with all learning, but are simply a result of the education and society we participate in? For example, I often relate my learning to a computer filing system where files are linked by outcome, content and experience tags. Here is one example of learning difference between cultures. A few years ago I was volunteer teaching in a Nepal in a grade 3 English class. I had observed the teacher for a few classes and noticed that much of the teaching was straight from the text book provided to the students and was based on rote memory strategies. This was not my style of teaching, so I thought I would try it my way the next day to see what would happen. The lesson was on synonyms, so I decided to take the information from the textbook and reorganized the main information into a mind web for the visual learners. None of the students seemed to understand what I was doing, even the teacher looked confused. This is when it became apparent to me that even presumed simple learning strategies are not innate. These students were used to rote memory, copy and repetition methods, and this visual strategy needed more introduction to be effective. Or perhaps these methods were not as effective for these students because that already had acquired learning strategies, which I then needed to regard as their ‘type of learner’. A simple paradigm shift, but a worthwhile one at that. I saw true beauty of humanity in a classroom today that brought tears to my eyes. Curry, colours and kindness. These are the first things I notice when I arrive at the Seniors’ Center for the English Conversation class. The smell of curry lingering in the air. The bright warm colours of saris, skirts and hats. The kindness in the eyes of the aged Bhutanese and Nepalese eager to learn and speak a few words of English with trusted teachers. All of it is beautiful. Those of you who are familiar with the Lethbridge area will know that many of these people lived for many years in refugee camps, with little or no education. The students greet us with laughter and clapping of hands. I can see their pure joy and happiness to be among one another. The students giggle when the teachers point out that all of their names start with J. Some students who understand laugh in amusement. Others follow suit even if they are unaware of the joke at hand. The students stammer through sentences such as “My name is ___” or “I have a ___”, but each one comes to the front of the class with a smile and a confidence to state their words. All of it is beautiful. These students are referred to as babies, as their language skills are very basic. Many still rely on repetition and mimicry of body language to reciprocate in communication. One tiny old man sits in the seat next to me. It takes me a few minutes to realize that his hand motions are not a game of charades, but sign language. When it is his turn to say his sentence - “I have a whale” - (seeing as the toy he holds in his hand is just that), he is able to sign his sentence with guidance from the teacher. All of it is beautiful. These students are not here to advance their careers or because someone is making them. They do not need to learn English, they have supports and translators that help them navigate through daily life. So why are many of them there, especially in the winters of their lives? They are there purely to learn and to embrace the relationships around them. This is education at its best. Education that is not motivated by the desire for success and that is chosen by the student. Even though many of them have struggled and lived though many hardships, they choose to learn a few words with so much happiness everyone in the room could feel their warmth. All of it is beautiful. Language is such a beautiful, delicate gift once you realize the complexity of it all and what the world would be like without it. The way it defines our relationships, identity and every minutes of our lives. What a gift it is that I am writing this blog to share a personal experience. In my adolescence, I was an avid painter. Many, including myself, thought I would pursue art as a career. I must admit now, I have a room dedicated to art but the brushes and tubes collect dust. When some people have asked if I paint anymore, they looked disappointed when I reply no. One person said “That is too bad. That is like putting diamonds in a cupboard”. Flattered as I am at the compliment, I disagree because it led me to something even greater. I believe painting used to give me a way to see the beauty that exists around us. In a world where one can be easily drawn into the sadness and hardships present in today’s world, it is at time necessary to intentionally seek for the good and beauty that exists. The beauty I used to seek through images and colours, I now find in teaching. I see the beauty in helping raise a generation that cares for one another. I see the beauty of helping students of all kinds fight through their struggles. I do not need painting as my window to the greatness and beauty the world holds, I find it in my classroom every day. That is where true beauty can be found. Today at #LethCamp I attended a session on Learning for Assessment with some amazing teachers. The ideas and conversation that flowed in that room were inspiring. One of the ideas that stood out to me is that self-reflection is key to students becoming self-motivated learners who are engaged, ethical and entrepreneurial. Inspiring Education directs education to promote students who are engaged, ethical and entrepreneurial. This is great, but students are going to have to buy-in. We cannot give them notes and lessons followed by worksheets and quizzes to give them these skills; they need to get there on their own. This is where self-reflection comes in. When a students can think about a goal or tasks at hand, then evaluate their successes, failures and possible ways of extend their learning, they are developing as self-motivated learners. We have to ready them for the world of infinite possibilities, where if they can dream it, they can do it. In my last post about Using Ipads in the Classroom, I discussed the effectiveness of my students’ self-reflections. As an educator I know the citizens of tomorrow will need to be self-guided learners who collaborate effectively with others. I see the diversification of the current job market that coincides with the infinite combinations of interests, passions and goals that students have. We are seeing a transition from a world of countable professions – teacher, lawyer, doctor, welder, secretary, etc. – to an infinite array of jobs that perhaps did not even exist yesterday. Education needs to move towards a model that not only differentiates for various types of learners, but differentiates for various learner goals and motivations to accommodate this transition. As an educator, I need to embrace and nurture the individual interests and aspirations of each of my students. In saying this, it means taking the leap of faith to becoming an educational facilitator. Taking a role where I am not directing my students learning, but they are directing their own learning – frightening, but invigorating. To get there, they will have to continually evaluate their own growth and weaknesses, assess their goals and progress in relation to their long-term plan. This is no small order, but student self-reflection as a part of assessment is a great place to start. I started this assignment the first day the students came back from their Christmas Holidays. This ensured that they had at least a few good stories to share with their classmates. The students were asked to choose a story and fill out the 5 Ws question sheet and an addition planning sheet. I have attached this resource with this post - find below. We discussed the difference between memorizing text and oral story telling. After students had filled out the planning sheet, they practiced telling their story to a partner. I modelled proper oral presentation/ story telling skills, and then encouraged them to tell the story without reading off the planning sheet. The students paired up and recorded each other telling their stories without their planning sheets. They were allowed enough time to try a few times if needed. The situation was low stress for the students since they were not in front of a large group and knew they could make corrections if needed. The class watched the story PodCasts together. While the students watched their own PodCast, they filled out a self-reflection (3 positive comments and 3 suggestions). This was very effective, since many of the comment I heard while my students watched themselves on screen sounded like “Oh, I do read too fast, Mrs. Marcotte,” or “Oh, I forget to take pauses”. All comments I have told them before in Daily 5 conferencing, but may not have clicked for particular students. 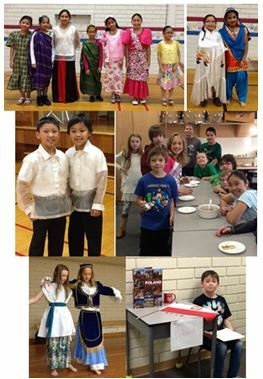 This past Friday our school held its first ‘Cultural Fair’. It all started with my Leadership class, which is one of the option classes my school is piloting this year. We started by talking about qualities of a leader, while looking at models like Terry Fox. Then we learned about different types of leadership projects; action, awareness and fundraising. After a few weeks of exploring how projects should be planned and structured, the students decided to take on organizing a cultural fair. What was the end result? Out of our 230 student body, 50 students participated. We had a variety of events throughout the day, including country presentations, food sharing and performances. The confidence and enthusiasm demonstrated by students was amazing! We had 10 proud students sing us the Pilipino National Anthem., and then a grade 2 student serenade the school in Spanish (making all heart melt). Many dances were performed from several different cultures, all of them wonderful. Even a few grandparents showed up to support their grandchildren in teaching about their cultures. Throughout the day we also invited students to wear their cultural dress and to bring food to share with their class. So many wonderful dishes were shared - butter chicken, poutine, Pilipino noodles, samosas, borsch, perogies, dulce de leche, plum cake, double buns. During this time in Saraguro, we learned of a non-traditional school in the community. When I saw this video about the Independent Project, I was reminded of my visit to this school. Maria Gabriel Albuja is the founder of ‘la Unidad Educativa Experimental Activa Multicultural Trilingüe Inka-Samana’. She also started the non-traditional school Inka-Samana with her husband. She was kind enough to show us the school in the community and teach us about the pedagogy there. The school was established in 1986. Each student attends in their own way, at their own rhythm. One of the students from this school told us for his thesis (explained in my excerpts) was to rebuild and repair motorcycles. There were not tests, no homework, just independently chosen and researched projects. Below I have copied excerpts of my field notes from the trip related to the school. Maria Gabriel showed us a slide show she did on the school she teaches at. The initiative is called Inka-Samana. It is based around liberal learning, compassion, independent learning. At the end of high school students are to write a 70-page thesis on a subject they specialized in, which was chosen by themselves. There are no tests in the school for the students. The school is trilingual; Spanish, Kichwa and English. They learn traditional lessons; clothing making, nature studies, food making. She said a 16-year-old girl who wants to be a doctor is working at a hospital doing autopsies and learning about medicine. She said they allow their students to cry, they simply listen and console, not interrupting in order to allow the person to let out their emotions and heal. She took us to the school which both her and her husband started, that same one she showed us a slide show on. The downstairs part was an auditorium with chairs, it may be used for a small theatre or large classroom. On the other side were art rooms, a storage room. She said there is a teacher who supervises outside all day so the kids may play there when they please. She then took us up the stairs where there was a large classroom. It is divided into three linguistic stations; English, Kichwa and Spanish. She said that teachers and students who use swears in English are made to eat a spoonful of aji (a type of hot sauce). The classroom was stacked with resources; language books, numberless math exercises, posters, notebooks, etc. She said there is no homework or tests but that the students are given diagnostic reports on their progress. It seems as if the students do not wear shoes inside, or at least their outdoor shoes inside. We waited for her while she did some things in the upper office. I noticed painted on the wall was a map of the world, which is now also covered in soccer ball marks from the ball being kicked against it so many times. The school itself is painted in pictures of indigenous themes. Saraguro typical dress, a picture of what might have been from a legend of Inti, natives dressed in feather and loincloth. The logo of the school is a tupu (a type of clothes pin) which comes to a point as a pencil. Instead of the rays of sun there are 4 girls and 4 boys dressed in indigenous clothes. The middle is the face of the sun. Inka Samana has established their own curriculum. It is my hope that with Alberta curriculum redesign, we may see school have the flexibility to accommodate students in ways similar to Inka-Samana and The Independent Project. As our world changes, knowledge is becoming more and more available. We need to teach students how to access this knowledge, how to apply it, and how to dream. Without the desire to learn, students will not likely take the initiative to find and apply the vast knowledge that is available to them.